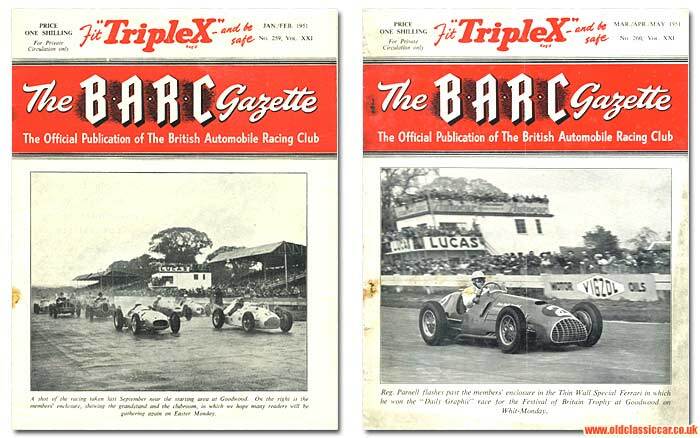 The BARC Gazette magazine by the British Automobile Racing Club. Homepage. This page: A look at the magazine distributed to members of the BARC in the 1950s. Just as Iota was the official magazine for racing members of the Half-Litre Car Club, so the B.A.R.C. Gazette was for members of the British Automobile Racing Club. These two issues both date to 1951. The B.A.R.C. continues to this day, although their members' magazine is now called "Startline" rather than "The B.A.R.C. Gazette". The Gazette was published every two or three months, if the dates on this pair of magazines are anything to go by. The first of the two copies is dated Jan/Feb 1951. Below the advertisement for Triplex (car glass), there's a photograph taken at the start of a race in September 1950, at the club's then-home of Goodwood in West Sussex. Various single seaters are seen blasting away from the line at this rainy meeting, including examples of ERA, Alfa Romeo and Maserati. The second issue is dated Mar/Apr/May 1951, and features another photograph taken at Goodwood, this one of Reg Parnell in the "Thin Wall Special" Ferrari. Advertising for Lucas, Autocar magazine and Vigzol Motor Oils can clearly be seen in the background, as can the packed spectator viewing areas. Advertisements for Cromard chromium-plated cylinder liners, Ferodo brake linings, Dunlop Tyres, and details of the latest 18hp Lea-Francis and Jowett Jupiter motor cars feature in the first few pages of the magazine, before the reader arrives at the editorial. By the start of 1951, the club membership stood at 3,707 members, the highest in the club's history, up a useful 750 compared to the previous year. Evidently with thoughts of the war and subsequent shortages beginning, slowly, to recede in the memory, interest in motor racing - often with cars stashed away for the duration of the conflict - was on the increase. This, despite there being no purpose-built racing tracks in the UK to use. Brooklands was no longer fit to race on, nor was Donington, both having been used by the military and a long way from ever being re-usable. Therefore enthusiasts turned to old airfields, many now quiet following the end of the war. Goodwood was just one of many former RAF airfields turned over to motor sport, its perimeter track proving to be a perfect setting for the resumption of motor racing in the area. 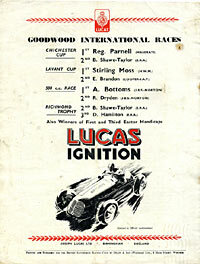 The first meeting at Goodwood took place in 1948, and continued to be a presence on the motorsport calendar until 1966. In later years it would be re-juvenated and go on to host Revival meetings for cars built upto and including 1966. A list of newly-joined members is given, and amongst their number are some notable names of motoring past. "C. Clutton" for instance could well be Cecil (Sam) Clutton, a noted VSCC collector of fine motor-cars and author of various books on the subject. The name "C.A. Vandervell" also appears, he was father to Tony Vandervell, campaigner of the (Ferrari) Thin Wall Special, and the man behind CAV and the Vandervell Thin Wall bearing companies. "A new "Resmat" surface has been laid around the entire track, and it is desirable that this new surface is "bedded" down as much as possible before racing takes place. A new road surface on the public highway has the advantage of being bedded-down by regular and relatively slow-moving traffic, and the road contractors tell us that some similar traffic-loading would be a great advantage at Goodwood from the point of view of the new surface. Therefore we invite you to run over to the course on Saturday next, 10th March, between the hours of 10am and 1pm, or 2pm and 4.30pm to take a few turns around the circuit. This - apart from any help it gives us - will give you an opportunity of learning a little about the course over which competitors race, and will enable you to see the various improvements that have been made, and are being made, at Goodwood. On Saturday 10th March, no excessive speeding will be allowed, and racing cars will not be admitted to the circuit. Cars must travel in a clockwise direction and overtake on the left (Continental rule of the road). There is no need to advise the Club that you intend coming: just turn up if you can." A donation of 5000 GBP by Dunlop towards the construction of a new circuit at MIRA, near Nuneaton. The Rover Company received the RAC Dewar Trophy for the most outstanding technical achievement in motoring during 1950, namely its gas turbine car. This was the second time they'd won it, in 1925 they received the trophy due to a 13.96hp Rover car having successfully completed fifty ascents and descents of the Bwlch-y-Groes pass in Wales. Kieft were planning to build a new streamlined & fully enclosed body for their racing chassis, with a view to gaining some speed records. Stirling Moss, who'd recently become a director of the company, was down to be the driver. The Nuffield Group exported 104,000 vehicles in 1950. My second copy of the BARC Gazette, issue number 260, continues in a similar theme to that of issue 259. Amongst the articles is a report on the Easter Monday meeting at Goodwood. Evidently the newly-laid "Resmat" surface was doing its job, Reg Parnell broke his own lap record, circulating in his 4CLT Maserati at a record 90.00mph average. Alf Bottoms also scored a new lap record for the 500cc class, lapping at 81.20mph in his JBS. This meeting also saw the debut of several new racing cars, notably the Mark V Coopers, the single-seater HWM driven by Moss, and the Formula B Lea-Francis-engined Connaughts. The Anglo American Oil Company would now be known as the Esso Petroleum Co. Ltd. Sales leaflets for the new Dove-Cot collapsible caravan were now available from 20th Century Novelties Ltd., of Thames Ditton in Surrey. A photo of a Dove-Cot may be found on this page, which looks at 1950's issues of The Vauxhall Motorist. There were nearly 9,000 signed-up members of the BRM supporters association. The Cumberland Garage and Car Park had introduced a scale for parking charges, based on the space required by each individual parked car. News that in June, a team of four drivers planned to drive an A40 Sports around the world, hoping to complete the trip in thirty days. Oceans would be skipped thanks to a specially-adapted Skymaster aircraft, chartered from Dutch airline KLM. I'd be interested in acquiring any more old copies of the BARC Gazette, if there are any more out there. The BARC was formed following the merger of the Brookands Automobile Racing Club, and the Junior Car Club, following the first Goodwood meeting in 1948. A number of programmes from events organised by the BARC can be found in the motor racing programmes section at oldclassiccar.